Very new to wood working. I have dabbled with some pocket hole projects and I have just picked up my first table saw. It’s a Delta 36-725 that I picked up on Craigslist for 250.00. 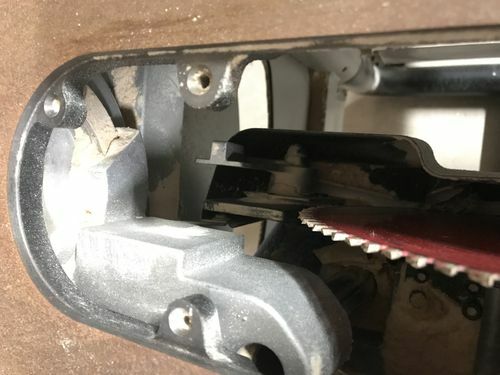 The saw is in great condition but missing the riving knife and blade cover assembly. I can do without the blade cover but I’d really like to have the riving knife. I’m not sure how to proceed. Riving knives are about 35.00 but the whole riving knife assembly is almost 200.00. I am really hoping I don’t need the full assembly. I tried looking online for a detailed video or pictures of what it should look like so I figured I’d post some pictures here. The saw is also missing the wrenches. Can any wrenches be used or do I need the thin stamped wrenches to fit in the space? Any and all help would be appreciated. I am very new, and I’d like to keep all my fingers. I’ve got this same saw. I wanted to make a zero-clearance insert and I didn’t want to lose the kickback protection of the riving knife, so I made an insert out of MDF and installed the microjig splitter. I went on era[placement parts and tried looking at the diagram. I cannot tell if I need just the splitter or the splitter assembly. Huge difference in price though. Insane prices for replacement parts. 180.00 for the Irving knife assembly. I really hope I don’t need that. Based on your pictures, you already have the assembly, you just need the knife – which you could easily make yourself for cheap if you don’t want to pay $35 for a piece of metal. Congrats on your new saw. 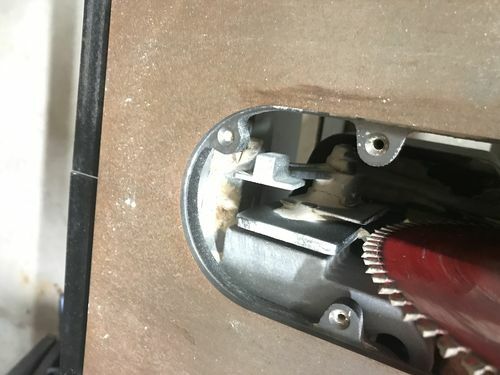 This is not riving knife related, but since you’re new to wwing I’ll point out that the blade that’s currently on the saw looks like a high tooth count crosscut blade (possibly a Freud Diablo 80T). Great for ply and fine crosscuts, but not good for rip cuts…especially in thicker materials. Get the blade and fence aligned perfectly with the miter slot, and keep your blades clean. That saw should serve you well. Best of luck with it. Thanks for the help. Will that blade just drop in somehow? I don’t see how it inserts. Amber it will be more clear once I have the part. Next does anyone know where I can buy a 0 clearance throat plate? Making one for this saw doesn’t seem all that easy. I see Rockler sells plates but I don’t think they will fit this saw. I was also planning on buying a different blade since I have no idea what the included blade has been used for. I was thinking the woodworker II? Blade seemed pretty well aligned using an adjustable square. Fence needs some adjustment as it is not as smooth as it should be and it rubs the table right now. @Brad, thanks for the note about the Microjig splitter. I’m making my own zero clearance inserts right now and I don’t want to use the riving knife that came with my saw. There are many ways to get this done. Best of luck! Welcome to the forum Usma. -- Is this thing plugged in? .. I was also planning on buying a different blade since I have no idea what the included blade has been used for. I was thinking the woodworker II? Blade seemed pretty well aligned using an adjustable square. I’d at least clean up the 80T and see how it does in ply or crosscuts. It’s paid for and has potential to be a very respectable blade that fills a niche that general purpose combo blades won’t. The WWII is a great blade, but is quite expensive for a general purpose blade that won’t do well in the extremes of thicker ripping and finer crosscuts. If your heart is set on a WWII, I’d grab the 30T version (3/32” thin kerf ) ...it’ll be a better blade to mate with the current 80T blade, and will rip efficiently in fairly thick material, plus has some versatility of other tasks. If the 80T does well and you don’t want to spend the big bucks for a complement to it, you could opt for a good 24T ripper like the Freud Diablo D1024x, Freud Industrial LU87, Irwin Marples, CMT Industrial or CMT ITK Plus. If you find yourself still needing a decent all around general purpose blade at a decent price…those brands all make good 40T and 50T choices, as does Infinity. Look for Delta 36-501, it’s the zero insert for the 36-725. You see the lever right behind the blade in your first and third pics? It is in the upright position and when pulled down to be horizontal, it presses in on a plate to its left. The knife slides in behind the plate, when the lever is up, and adjusts to two positions. Once the knife is in place, move the lever to the horizontal position. Note, the lever is on a spring assembly which is easy to unscrew. If you take it apart, you’ll see the posts the knife slides over and it should all make sense. Usma, welcome to LJ’s and the wonderful world of woodworking, where it can be therapeutic or make you crazy. You’re in a good place for knowledge and many of your questions can likely be found by searching the site for previously asked questions that all newbies can encounter. The advice above is all good, for the wrench you just need to find what the size of your arbor nut is and any wrench will work, the cheapo steel one might be handy if you were to mount the maximum capacity of your dado stack, but in general you’ll be fine. 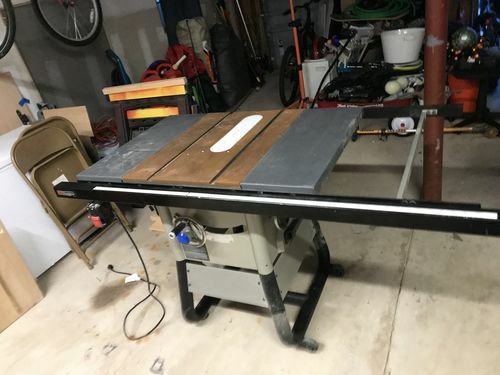 Looking at your pictures, I’d say you need to get after that rust and get the top cleaned, WD-40 and scotchbrite is where to start but you may need to go to some sandpaper in a sander if it’s particularly stubborn. 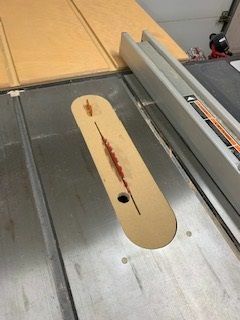 As it’s a used saw, your set up and “tuning” is very important to ensure safe cut quality, Kelly Mehler's table saw book is a great place to learn the how to’s plus lots of other information about table saws and how to use them safely. As you’re getting started and learning, you can do fine for a while using the Freud Diablo blades you can get at the HD. I generally keep this combination blade in the TS and will change blades for a specific special task, or if I have a large quantity of ripping to do I’ll put in a 24 tooth blade. You’ll have to find the sweet spot for your budget, there are Cadillac’s and Honda’s, you have to decide how to spend the $$$ because it can add up real fast in this hobby, the most expensive isn’t always the best route, if your layout and cutting skills need practice.